Removing man-made boundaries to build nature. What is it and why bother? 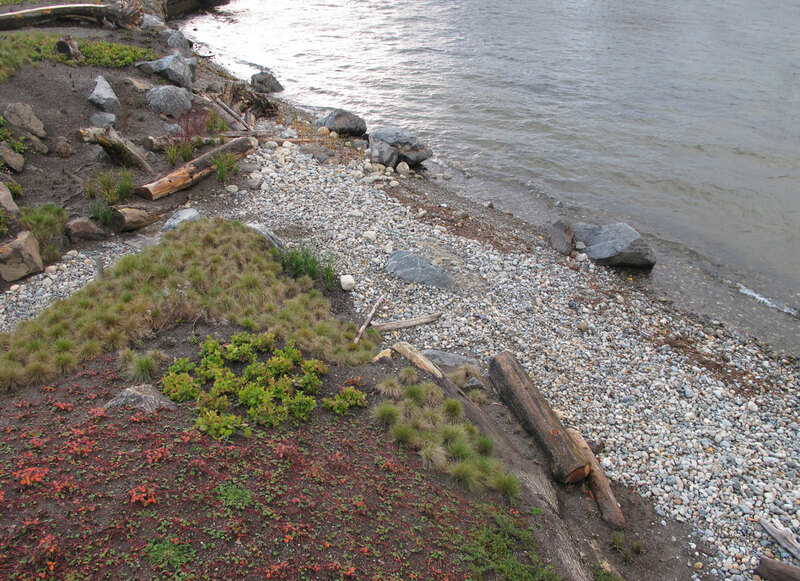 Shoreline restoration is the act of reclaiming a natural environment at the waters’ margin. 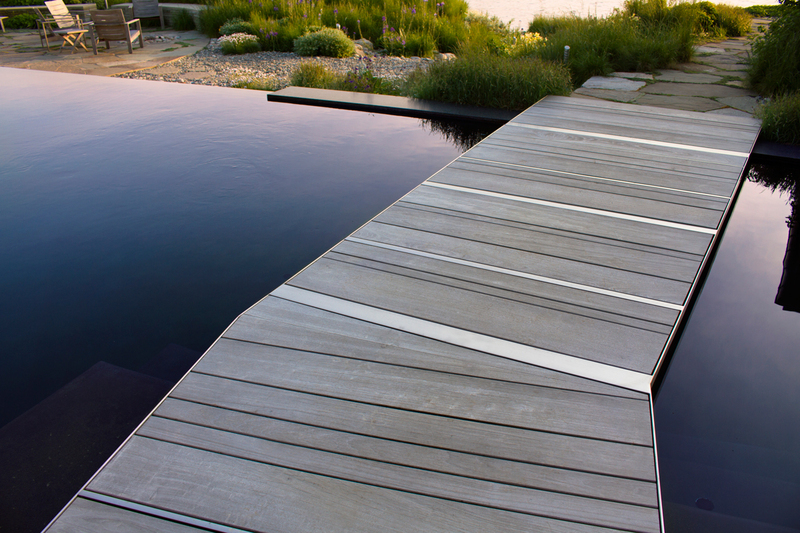 Man-made ‘hard’ edges – built in a misguided defense against nature – are removed and a ‘living’ edge is installed. The outcome is a better collaboration between nature and human recreation. 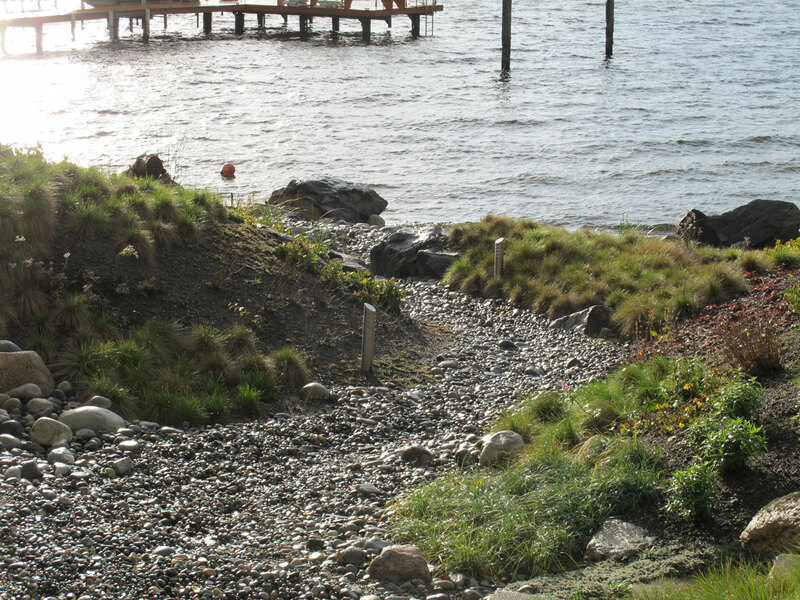 Shoreline restoration is starting to enter into the general awareness of homeowners and those looking to reconnect with natural elements — in a world, after all, that is at an ever increasing disconnect with it. This groundswell shift in public opinion is an indication that working with nature yields greater holistic results for those with property, supports the environment, and, at a local level, allows nature to flourish. 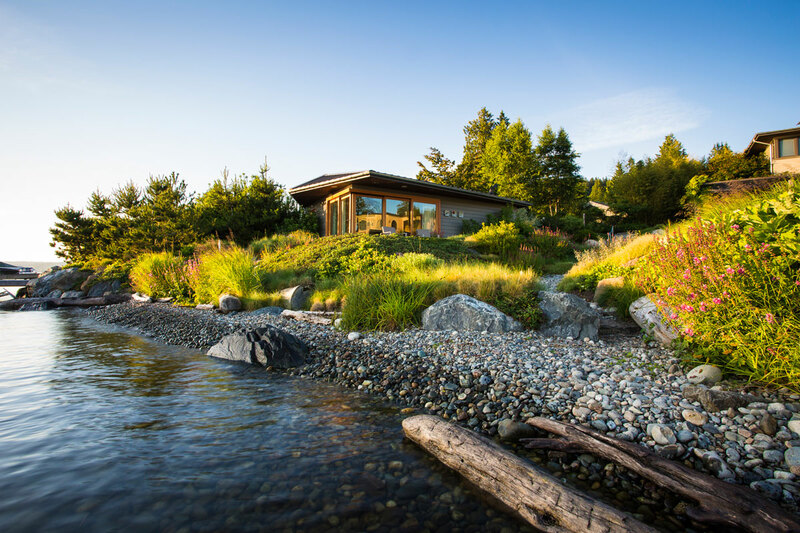 Fueled by a desire for change and looking creatively at all options available, a multidisciplinary team seeks out something greater for the homeowner, the property, and nature. Taking into account costs, resources and desired outcome, the project is designed and the scope of work is outlined, it is then submitted for permitting. With permits in hand and timelines arrived at (with an acknowledgement of ‘fish windows’ ), breaking ground invariably means removal of man-made defensive structures. 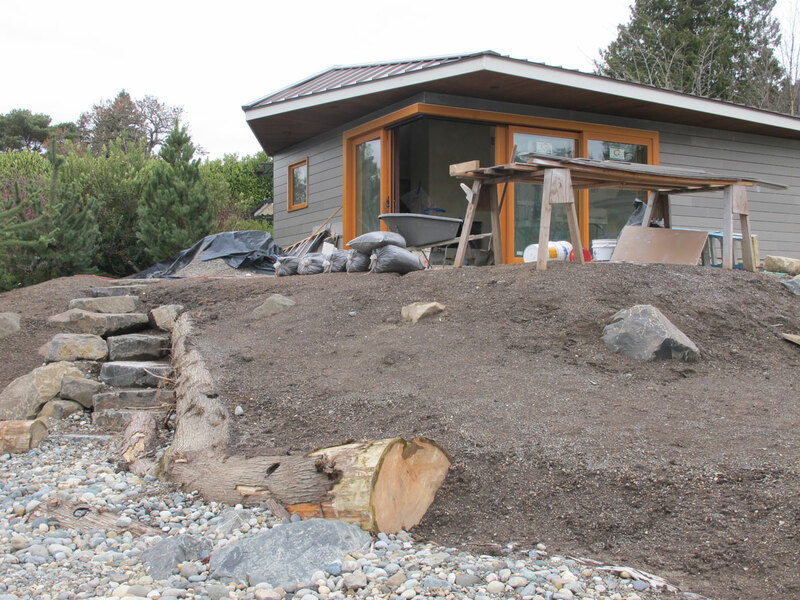 At the waters’ edge rocks and logs, if needed, are placed; the bank is regraded; beach substrates are laid (rounded pebbles of differing sizes to encourage spawning), and plant life is established. The term ‘fish window’ means the times during the year when in-water construction work will not affect spawning salmon and other fish. A “hard” bulkhead severs ecological connections. Wave energy, left unattenuated, ricochets back into the water. This scouring action is hostile to riparian (water-side) life. Whether or not aware of it, people are drawn to ‘edges’ in the landscape: a clearing in a forest with trees touching against a meadows edge, or the classic appeal of standing at the waters’ margin as one element (water) brushes against another (land). Edges are biotically rich, and the waters’ edge especially so. 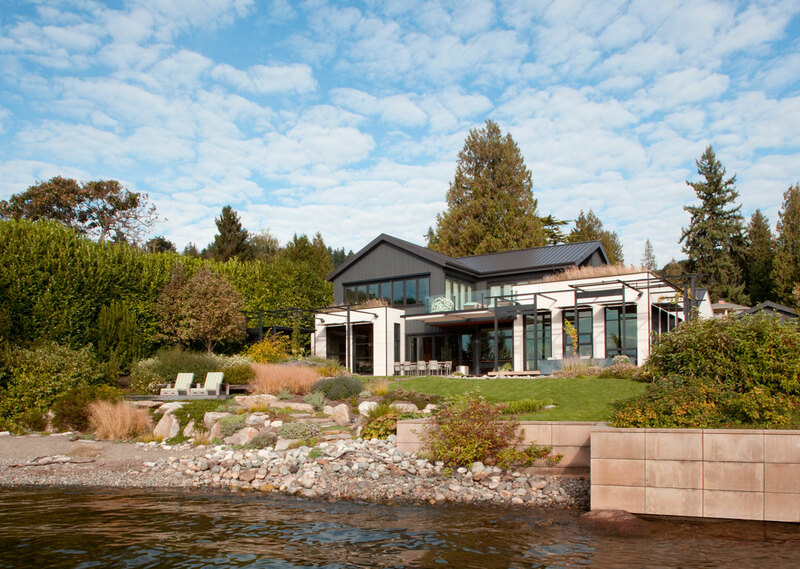 Skillful design at the shoreline assimilates this and incorporates other factors of a project such as desire, creativity, resources — and bureaucracy — and brings them to life. 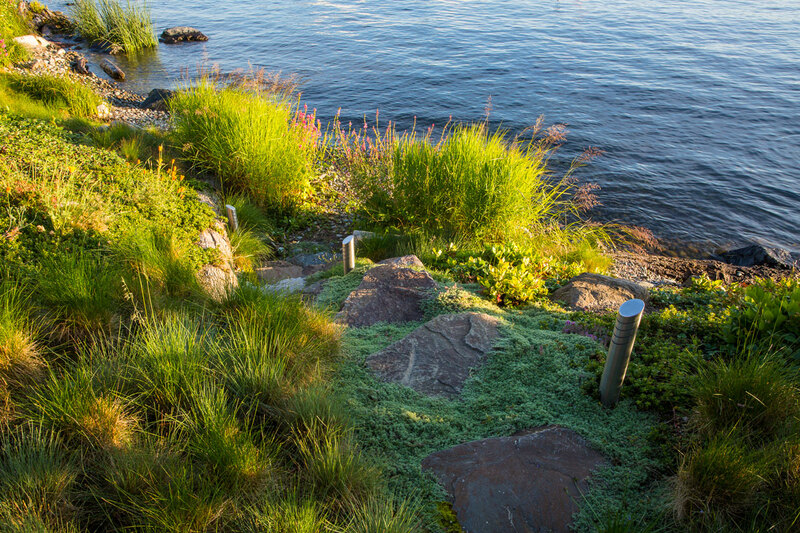 Now the homeowners can enjoy all of the benefits of a “Living Shoreline”, a shoreline that is durable and that bends and flexes with the elements and nature. A more gentle slope from land to water allows for potentially erosive wave energy to be attenuated, and, with its planted edge acts as its own defense against erosion while providing an important habitat for fish and wildlife. A scene comprised of native plants. 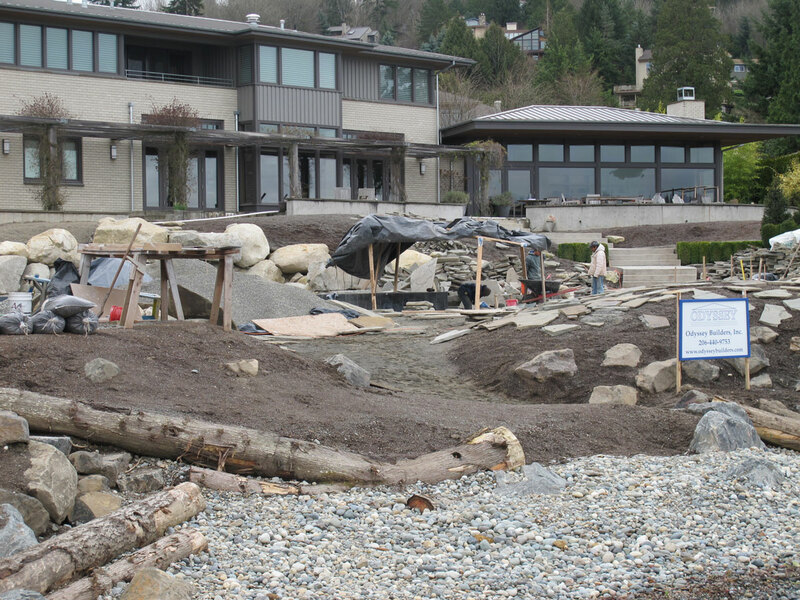 In it’s third year the shoreline plantings have now created a rich habitat for wildlife. 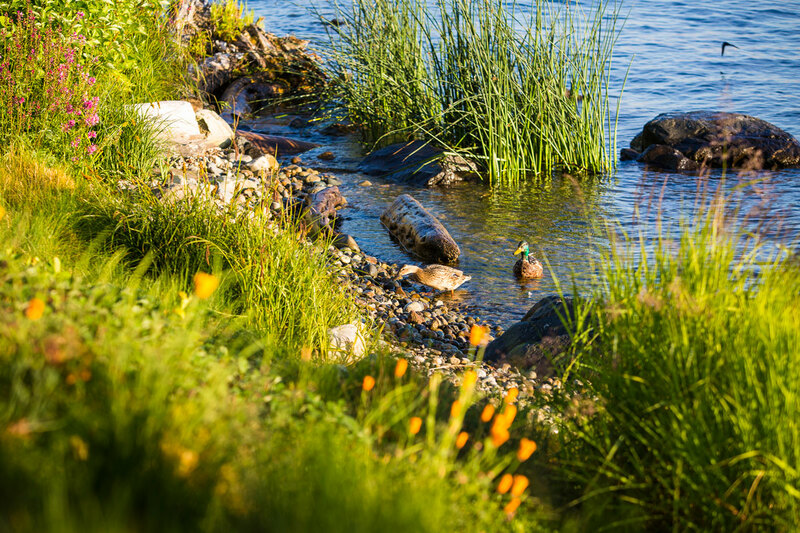 A ‘Living Shoreline’ is built to withstand erosion, but can now welcome and support fish and wildlife. The bulrush supports freshwater crayfish, ducks feel at home and otters can now make it ashore. A large print of Kandinsky’s Composition VIII, hanging on the walls of designer Paul Broadhurst’s studio, provided the spark for this new landscape on the shores of Lake Washington in Seattle. Playful, modern yet natural, the design has a whirling array of shapes and motifs — circles are spun off from a central point to be punctured by acute angles and dashed by sweeping curves. Yet within all of this the newly found natural elements press in and assert themselves. 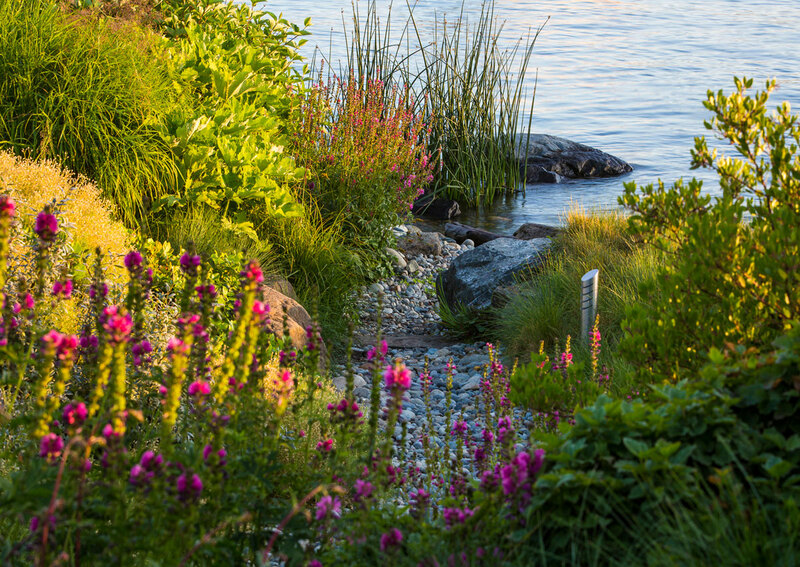 Rolling new topography, two-hundred feet of reclaimed shoreline, a fescue meadow and an extensive pebble beach are all natural elements orchestrated to create a dynamic space to enjoy nature, recreation, and human company. From its origins under the boughs of mature Cedars to a conclusion at the shoreline, a stylized Northwest stream is used as a narrative thread to weave together relationships between built forms and nature. 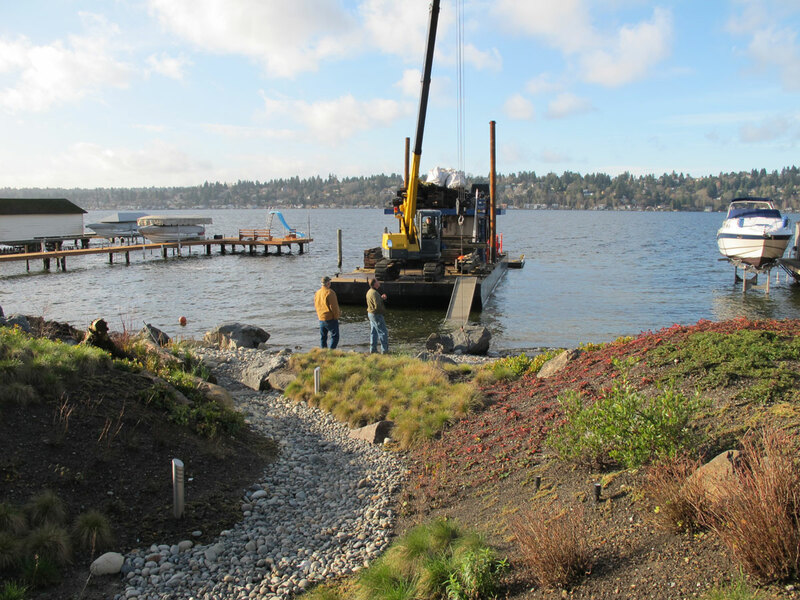 Shoreline Bulkhead Removal, Lake Washington. 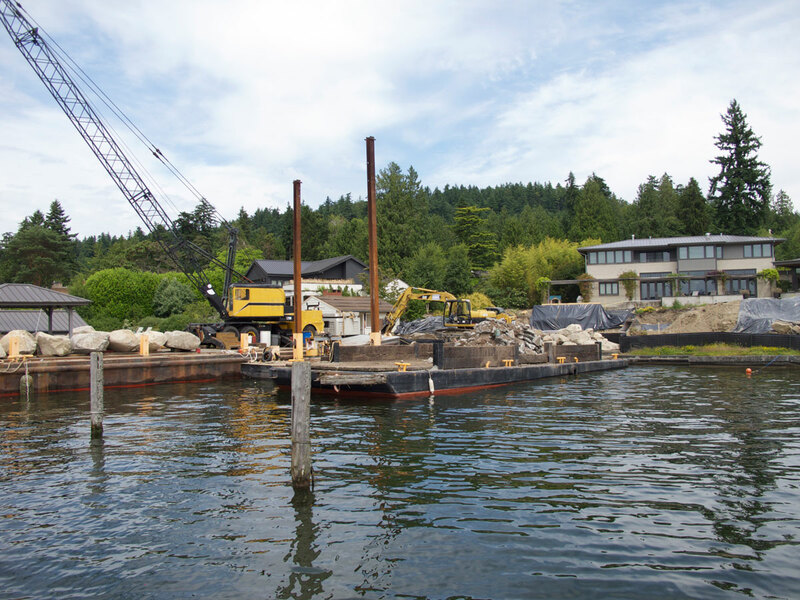 Working with the project lead, Paul R Broadhurst, The Watershed Company provided technical expertise for a shoreline softening design which removed the 85-foot long concrete bulkhead. GSH is a voluntary, incentive-based program similar to green building rating programs such as Built Green™ and LEED™. 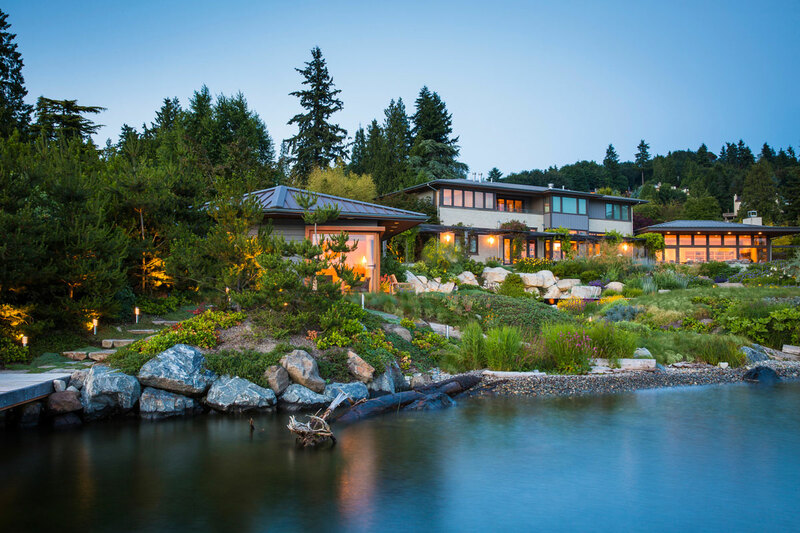 How a lakefront home’s shoreline was restored to make a home for wildlife, too. 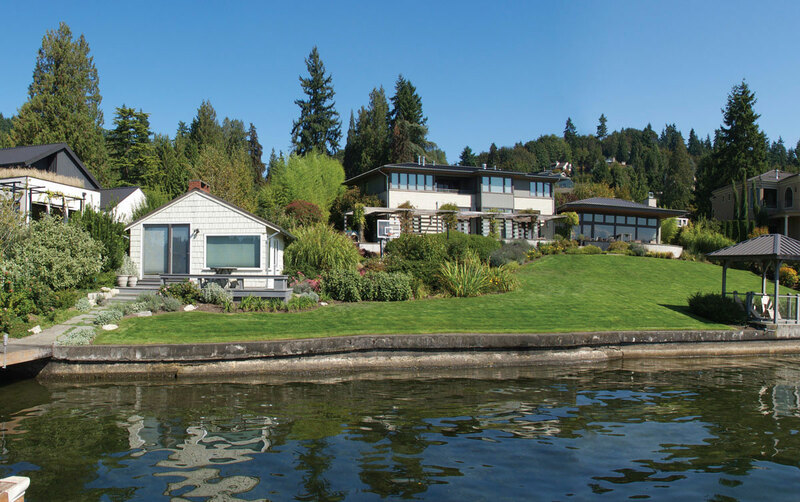 Waterfront and garden were connected, in a natural way, by getting rid of the bulkhead and designing a living shoreline in front of a Lake Washington home.